X-1 served in a research capacity in rigorous and extensive tests to assist the Navy to evaluate its ability to defend harbors against very small submarines. Further tests conducted with the X-1 helped to determine the offensive capabilities and limitations of this type of submersible. X-1 was originally powered by a hydrogen peroxide/diesel engine and battery system, but an explosion of her hydrogen peroxide supply on 20 May 1957 resulted in the craft's modification to accept a diesel-electric drive. On 2 December 1957, X-1 was taken out of service and deactivated at Philadelphia. Towed to Annapolis, Maryland, in December 1960, X-1 was reactivated and attached to Submarine Squadron 6 and based at the Small Craft Facility of the Severn River Command for experimental duties in Chesapeake Bay. In tests conducted under the auspices of the Naval Research Laboratory, X-1 performed for scientists who observed her operations from a platform suspended beneath the Bay Bridge, to learn more about the properties and actions of sea water. Remaining in an active, in-service, status through January 1973, X-1 was again taken out of service on 16 February 1973, and, on 26 April, was transferred to the Naval Ship Research and Development Center, Annapolis. 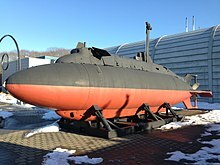 On 9 July 1974, the submersible was slated for use as a historical exhibit; and she was subsequently placed on display on the grounds of the Naval Station complex, North Severn, near Annapolis. In 2001, X-1 was transferred to the Submarine Force Museum in Groton, Connecticut where it is on display in front of the main exhibit building. ^ "Navy Tests First Midget Submarine As Close In Weapon. Popular Mechanics, February 1956, p. 124, bottom of page.